There are two main types of stroke, hemorrhagic and ischemic. Either can cause symptoms of stroke, but hemorrhagic can be the deadliest. Many times people will have transient ischemic attacks or TIA's for months before a stroke. A hemorrhagic stroke is one that results from a burst blood vessel in the brain. The most common cause of this is an aneurysym which is a "ballooning" of an artery. Although this can also happen in a vein and is called a venous stroke, these are not as serious or life threatening (usually) as arterial. The most common symptom that occurs is a sudden onset of a thunderclap headache. This type of headache results from an aneurysm that has burst. 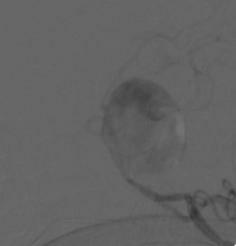 The picture below is an example of a very large basilar artery aneurysm from a 32 year old patient with a strong history of smoking. Smoking weakens arteries and can result in this problem. 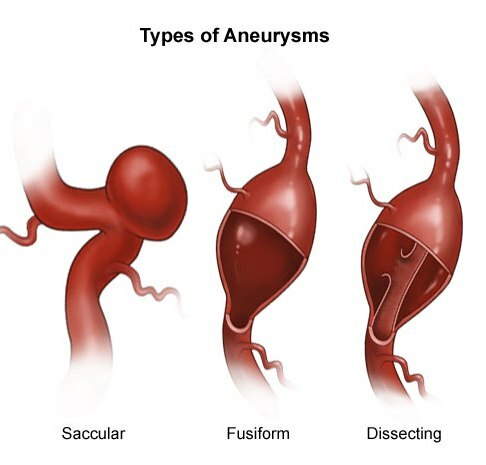 If the aneurysm is a fusiform type, then the headache may build slowly as the aneurysem leaks. The headache grows in intensity until the aneurysm finally bursts. This happens when blood gets between the linings of the artery and causes what is known as a "dissection". Eventually the pulsing of the blood weakens and separates the arterial walls and the leaking begins, followed by the full rupture. As far as types of stroke are concerned, this one is due to blockage of cerebral arteries. It is the cause of approximately 83-85% of all strokes or CVAs and therefore is the most common cause of stroke. Within this category are two subsets: thrombotic and embolic causes. Regardless of the cause, the blockage results in loss of blood to the area, and subsequent damage to the brain. A thrombus is a blockage in an artery due to repeated build up of cholesterol plaque and fibrin proteins in the blood. The body perceives it as an insult to the arterial lining and sends more proteins to form a blood clot in that area. The clot gets hung up on the plaque, resulting in a bigger problem. Eventually the vessel closes off and an acute stroke results. The stroke symptoms are the same no matter whether embolic or thrombolic in origin. Blood clots can form anywhere in the body. If a part of the clot breaks off, it can travel through the blood and get the brain causing a blockage or embolus. Again, due to lack of oxygen and blockage, a CVA results. The most common cause of emboli are cardiac, usually due to atrial fibrillation. This is a "quivering" of the upper chambers of the heart that results in pooling of the blood in the chambers. Pooling of blood results in clotting, which then travel to the brain. Emboli can also result from fat globules which rarely happens after a severe fracture of a bone. Types of strokes can come from various causes, and treatment is directed at the main cause. For instance, to treat a hemorrhage as an embolus could be quite dangerous. Clot busting medications for an embolus would only make a bleeding hemorrahge much worse. Without a doubt the biggest lifestyle factor affecting stroke risk is obesity. Surprised? Most people are as they are aware that high cholesterol, high blood pressure and smoking increases risk. The majority of people who have a CVA, their types of strokes are related to the fact that they are very overweight and sedentary. Family history plays a role too. Migraineurs with aura increase their risk by 4%. You have to add up all your risk factors and take charge of the ones you can change (family genetics is not one of them).